An air-breathing ion thruster would scoop up scarce air molecules from the upper atmosphere to use as propellant, letting satellites hold very low orbits around Earth. For the first time, the European Space Agency (ESA) has tested a novel air-breathing electric thruster that could allow near-Earth orbiting satellites to stay in space almost indefinitely. The thruster, designed to harvest atmospheric molecules and use them instead of onboard propellant, could also make future Mars exploration easier, ESA officials said. Satellites need propulsion to hold their position or move around in space. Conventionally, satellites use rocket-like chemical propulsion, but electrical thrusters are becoming increasingly popular due to their better efficiency. However, current electrical propulsion systems still need to use a propellant, such as xenon, and their mission lengths are therefore limited by how much propellant they can carry. Due to weight constraints, satellites can carry only a limited amount. Those orbiting close to the Earth, in the range of a few hundred kilometers (about 125 miles), consume it at a higher rate, as they need to compensate for the atmospheric drag that slows them down and pulls toward the Earth. Instead of carrying its own propellant, a satellite using ESA's new system would skim air molecules from the top of Earth's atmosphere. The molecules turn into plasma when compressed. An electric field is then used to accelerate the stream of plasma to provide thrust for the satellite. "Providing atmospheric drag compensation without the use of carry-on propellant, this kind of electric propulsion would let satellites orbit at very low altitudes around Earth for very long operational time," Louis Walpot, who leads the project at ESA, told Space.com in an email. "Normally their orbit would decay rapidly and they'd reenter the atmosphere," Walpot said. Together with the thruster, ESA tested an innovative collector that captures incoming air as it hits the thruster at the staggering orbital speeds of about 4.9 miles per second (7.8 kilometers per second). The collector strips nitrogen and oxygen molecules from the air, and turns them into fuel. It's this collector that makes the system the first of its kind, demonstrating how an air-breathing thruster would actually work in orbit. "This design of the collector was challenging because the air molecules tend to bounce out again, rather than be retained and compressed to a point where they turn into plasma, capable of being accelerated with an electric field," Walpot said. "The collector-plus-thruster design is entirely passive in nature — the air enters the collector due to the spacecraft's velocity as it orbits around Earth. All it needs is electric power to ionize the compressed air." A satellite propelled by an air-breathing electric thruster. The electric power, he said, could be easily obtained from solar panels. Walpot said the system would also work at the outer edges of the atmosphere of Mars, harvesting carbon dioxide molecules that make up the Red Planet's atmosphere instead of Earth's nitrogen and oxygen. "This is more than a hundred times less dense than Earth's atmosphere of course, so any such air-breathing spacecraft would fly lower — about 120-180 km," Walpot said. 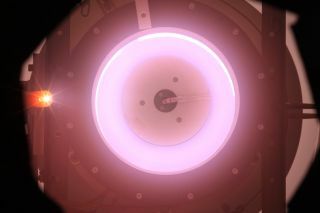 ESA, which funds the thruster's development through its Technology Research Programme, started working on the project in 2015 in collaboration with the Polish firm QuinteScience and Italy's Sitael. Researchers tested the technology in a vacuum chamber in Italy, simulating the surroundings at 200 kilometers (120 miles) altitude, according to the statement. The test setup for a prototype air-breathing thruster and compressor, visible here inside a vacuum chamber. The agency now plans to scale up the technology to a more realistic flight configuration. "This would increase the Technology Readiness Level," Walpot said. "Efforts will start to look at potential applications for the technology, future missions where it would be a good fit." He said the air-breathing thruster would work up to altitudes as low as 160 km (100 miles), since it can only operate in vacuum or near vacuum. For comparison, ESA's Gravity Field and Steady-State Ocean Circulation Explorer (GOCE) orbited at about 250 km (150 miles). GOCE used a similar electric thruster to keep itself in the orbit, but its thruster relied on the propellant xenon. The mission ran out of fuel after four years and seven months, after which the spacecraft plunged into the atmosphere. Using air as a propellant "opens up near-Earth space for new missions, which could be used for instance for very high-resolution imaging, or even to study the ever-changing conditions prevailing at the top of the atmosphere," Walpot said.